Fluor-BWXT Portsmouth is committed to being an active corporate leader to the communities that have supported nuclear and environmental remediation missions at the DOE Portsmouth site for more than 50 years. Our company and our employees are engaged in activities and organizations that enhance the quality of life throughout the area. Fluor-BWXT invests in economic development, education and charitable giving initiatives that provide the greatest impact to the region. Fluor-BWXT Portsmouth employees lent the United Way of Ross County a hand in mid-September when they volunteered to help with Community Care Day at the Middleground Youth Center in Chillicothe. At the end of the day, more than 30 employees assisted in constructing a 48-foot wall, knocking out four other walls, installing drywall, replacing carpet, painting more than 4,000 square feet of wall space, and cleaning over 700 square feet of carpet. 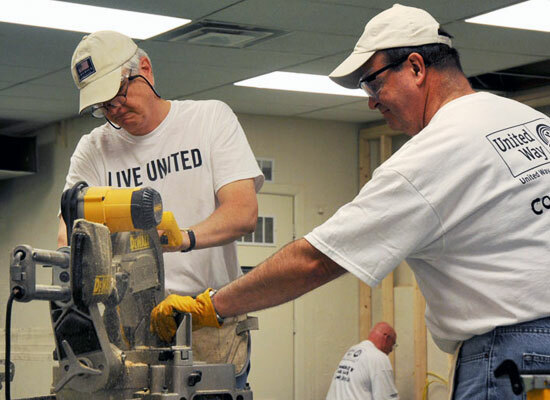 Pictured are Gary Hoovler (left) and Bruce Hanni working on timber for the new wall.